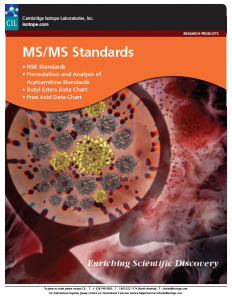 This is a link to our MS/MS Standards catalogue literature that includes all of the NSK products as well as the data charts for both butyl esters and free acids. Individual products are explained and listed with their specific information below. This set contains a dry mixture of 12 isotopically labeled amino acids. The mixture contains the following amino acids: Alanine, Arginine, Aspartate, Citrulline, Glutamate, Glycine, Leucine, Methionine, Ornithine, Phenylalanine, Tyrosine, and Valine. Accurate and complete reconstitution of the contents of one vial in 1 mL of high purity solvent will produce a concentrated amino acid stock standard. This set contains a dry mixture of eight isotopically labeled free carnitine and acylcarnitines. The mixture contains the following: Carnitine (CN), Acetylcarnitine (C2), Propionylcarnitine (C3), Butyrylcarnitine (C4), Isovalerylcarnitine (C5), Octanoylcarnitine (C8), Myristoylcarnitine (C14), and Palmitoylcarnitine (C16). Accurate and complete reconstitution of the contents of one vial in 1 mL of high purity solvent will produce a concentrated acylcarnitine stock standard. This dry mixture contains five isotopically labeled acylcarnitines and is a supplemental mixture to the NSK-B mixture. The mixture contains: Dodecanoylcarnitine (C12), Glutarylcarnitine (C5-DC), Hydroxyisovalerylcarnitine (C5-OH), Hydroxypalmitoylcarnitine, (C16-OH) and Octadecanoylcarnitine (C18). Accurate and complete reconstitution of the contents of one vial in 1 mL of high purity solvent will produce a l acylcarnitine stock standard. 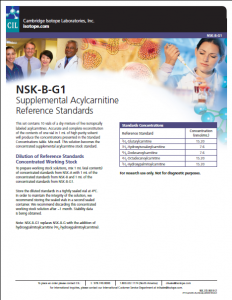 Note: NSK-B-G1 replaces NSK-B-G with the addition of hydroxypalmitoylcarnitine (C16- OH) (2H3-hydroxypalmitoylcarnitine). 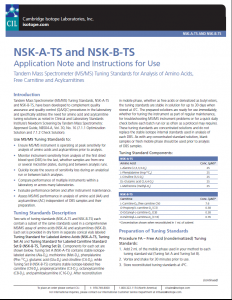 Tandem Mass Spectrometer (MS/MS) Tuning Standards, NSK-A-TS and NSK-B-TS, have been developed to complement quality assurance and quality control (QA/QC) procedures in the laboratory. 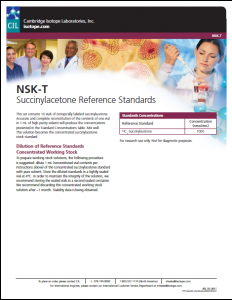 The tuning standard will: ensure mass spec if operating at peak sensitivity, monitor sensitivity from the first sample to last and between runs, compare performance between multiple instruments and across laboratories, and evaluate performance before and after instrument maintenance. The vial contains isotopically labeled succinylacetone (SUAC) used for lab developed tests involving Tyrosinemia Type 1. Accurate and complete reconstitution of the contents of one vial in 1 mL of high purity solvent will produce a concentrated succinylacetone stock standard. 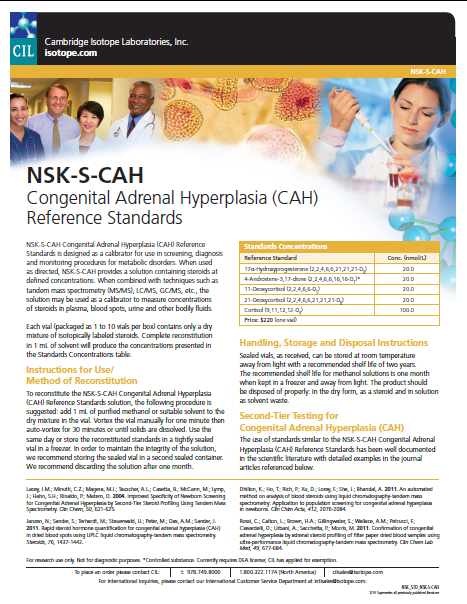 NSK-S-CAH Congenital Adrenal Hyperplasia (CAH) Reference Standards is designed as a calibrator for use in screening, diagnosis and monitoring procedures for metabolic disorders. When used as directed, NSK-S-CAH provides a defined concentration solution of the following steroids: 17a-Hydroxyprogesterone, 4-Androstene-3,17-dione, 11-Deoxycortisol, 21-Deoxycortisol, and Cortisol.. 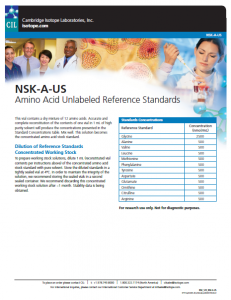 When combined with techniques such as tandem mass spectrometry (MS/MS), LC/MS, GC/MS, etc., the solution may be used as a calibrator to measure concentrations of steroids in plasma, blood spots, urine and other bodily fluids. This vial contains a dry mixture of 12 amino acids. Accurate and complete reconstitution of the contents of one vial in 1 mL of high purity solvent will produce the concentrations presented in the Standard Concentrations table. Mix well. 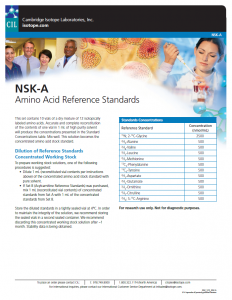 This solution becomes the concentrated amino acid stock standard. This vial contains a dry mixture of eight free carnitine and acylcarnitines. Accurate and complete reconstitution of the contents of one vial in 1 mL of high purity solvent will produce the concentrations presented in the Standard Concentrations table. Mix well. This solution becomes the concentrated acylcarnitine stock standard.